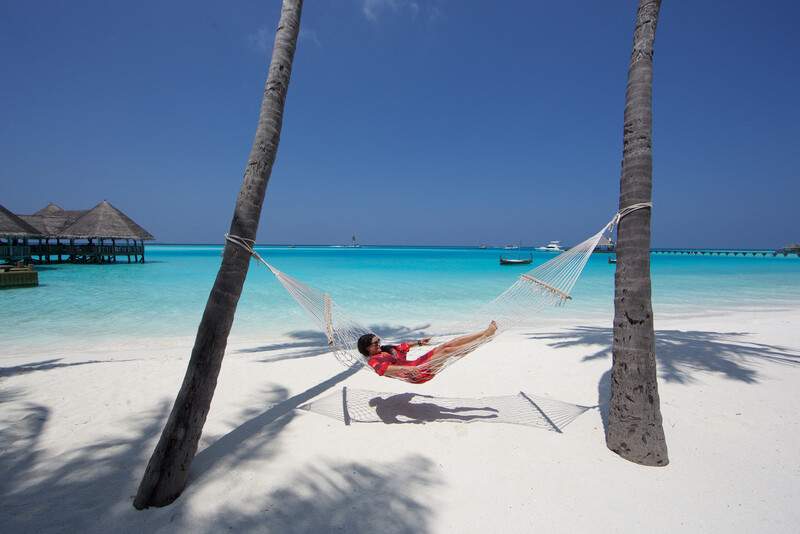 Hot off the press from Gili Lankanfushi Maldives, an ultra-luxurious eco resort on its own private island. “No news, no shoes” is the philosophy at Gili Lankanfushi Maldives, a Robinson Crusoe style luxury eco resort on its own private island – and arguably one of the most beautiful beach destinations on the planet. It boasts white baby powder sand and warm crystal clear lagoons. 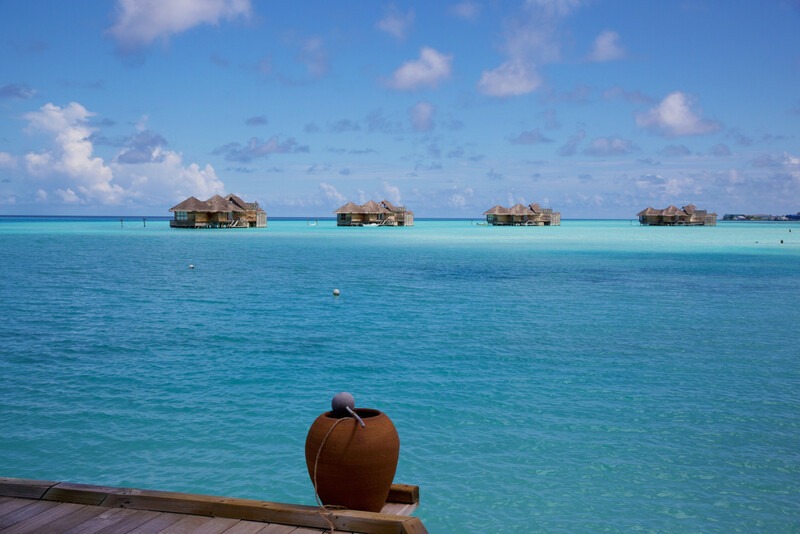 Jetties thread across the tide leading to multilevel overwater bungalows, while the more exclusive villas are only reachable by boat. Each guest at Gili Lankanfushi is assigned their own “Mr. Friday” who will serve as a personal butler, arranging all requests and making sure everyone is enjoying themselves to the fullest. Gili Lankanfushi is an eco-friendly resort. The overall concept and design, while beautiful, has been cultivated around waste management and strict energy conservation. For example, almost every structure was crafted with an open-air theme that allows for more breeze and less air-conditioning. The property has been built of renewable sources and responsibly harvested wood. Additionally, there are two gardens on the property in which organic waste is composted in an effort to waste less. They also support local schools and educate children on energy saving, waste management, and eco design. 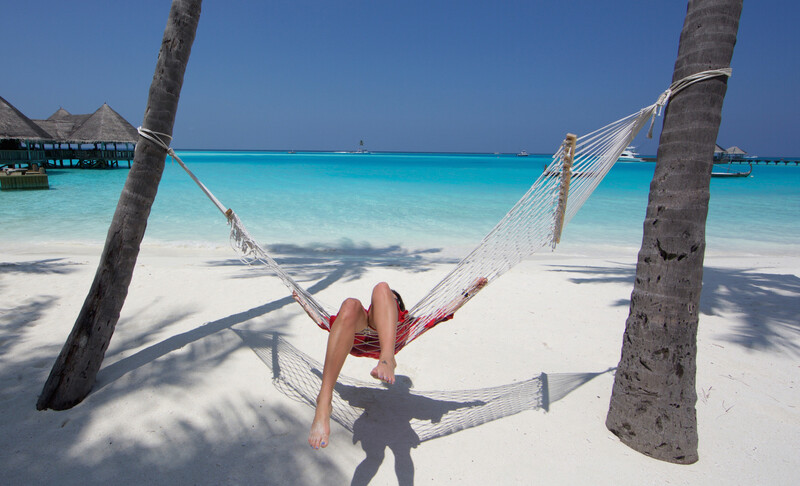 Gili Lankanfushi is the ideal place to go relax, but it also offers many activities and adventures. Guests can start the day with complimentary sunrise yoga, and then go Hobie Cat sailing, kayaking, windsurfing, or snorkeling. There are tennis courts on the property and lessons can be given for an extra fee. Cruiser bikes serve as the main form of island transportation and are given to each guest. One Palm Island sits right off the shore and is a great spot to swim out to. Private yachts are available for day charters, as are fishing boats and sunrise/sunset cruises. Gili Lankanfushi has an outdoor jungle cinema which can be booked for private movie screenings. Maldives is not an easy place to get to. Luckily I had been traveling in Sri Lanka the week prior to visiting Maldives and therefore I enjoyed a short and easy flight via Emirates. I was a bit nervous about landing in Male late at night and then having to take a boat over to Lankanfushi Island, but it was completely stress free and easy. I landed, went through customs, walked out the back door where my Gili Lankanfushi boat crew was waiting, and boarded the private boat transfer directly from the dock at the airport. My husband and I were given cold towels and a drink and twenty minutes later we were at Gili Lankanfushi. Our villa suite was quite impressive. We had booked their most basic accommodation (at $2,000 per night) a 2,000 square foot overwater beach bungalow with a living room, bedroom, large bathroom, and rooftop deck. The bathtub and outdoor terrace were my favorite parts – totally open to the ocean with a view of One Palm Island in the background. For larger groups, Gili Lankanfushi offers the “Crusoe Residence” and a “Private Reserve” which are only reachable by boat. The Private Reserve is definitely going on my bucketlist…check it out and you will see what I mean. Dining at Gili Lankanfushi was nothing short of lovely. Breakfasts started with a massive buffet right out on the beach, and ended with a “cheese and chocolate room” inside of an underground cellar. Lunch was mostly eaten at the Over Water Bar, which features 360 degree views and an overwater terrace with lounge chairs, sofas, and large comfortable booths. The intimate Japanese restaurant, By The Sea, has a sushi bar and teppanyaki table and was a great choice for dinner. Just be sure to make reservations in advance as it does not seat many guests. Each guest gets a cruiser bike to ride around the island, but buggies can be called and used for transportation as well. The island of Lankanfushi is a short 20 minute boat ride from Male. 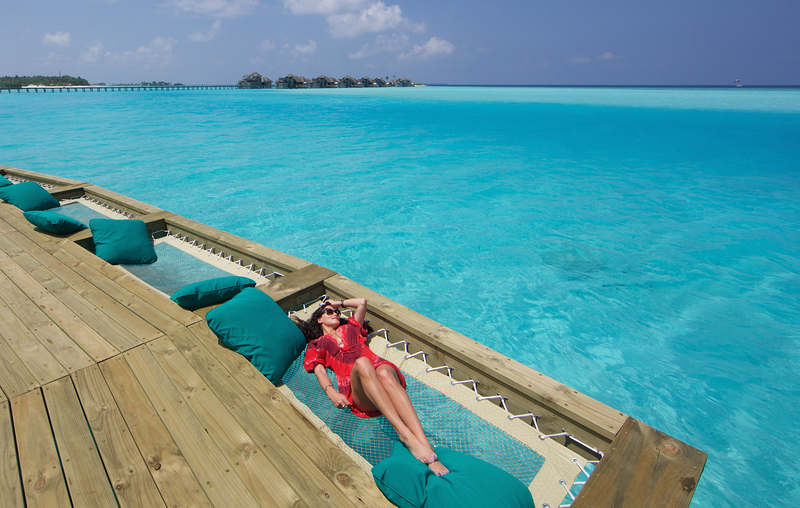 It is a lot easier to get to than most resorts in the Maldives. The best time to visit is between January and April. Monsoon seasons is May to October. I would not recommend visiting during monsoon season as there won’t be much to do. 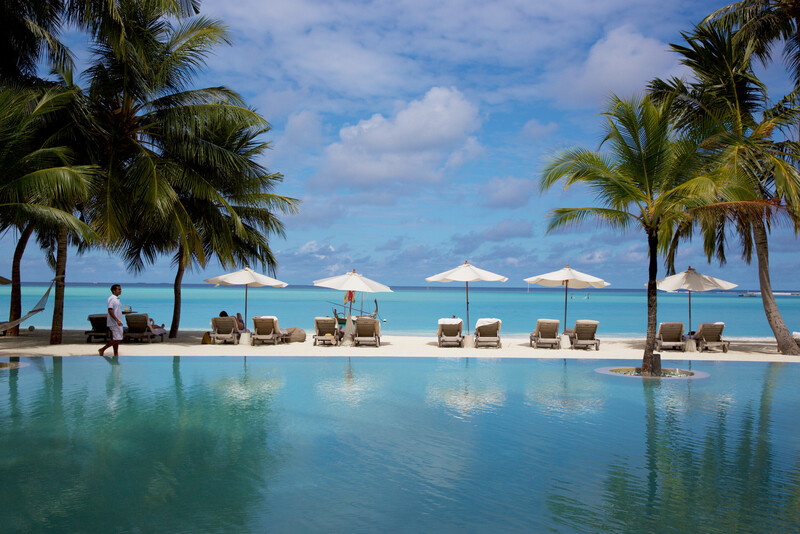 Be prepared from some serious humidity and heat at any time, as Maldives sits on the equator. Gili Lankanfushi offers some spectacular private dining options. If you are on a romantic getaway you should look into some of them. For example, private island dining, wine cellar dining, sunset boat dinner, etc. Don’t forget to budget extra for the boat transfers to and from the airport. Don’t be afraid of the sharks seen around Gili Lankanfushi. Most of them are harmless, they just look scary. Wow, SIMPLY STUNNING!!! That’s You and the Resort!!! As always, such a beautiful job you have done presenting this resort to us!!! It’s definitely going on my bucket list!!! By the way, I contacted Aman resorts to request a quote for a trip to India. Of course I told them that the only reason I’m going there is due to Misha Gillingham @ Wildluxe.com’s recommendations!!! Thank you Matthew! So glad you contacted Aman for india. That’s the way to do it! I’ve always wanted to go to the Maldives! So cool Gili Lankanfushi is an eco hotel! I didn’t know they had eco hotels in the Maldives so now I have to go stay there! Your photos are amazing!! Yep, it’s eco! Pretty awesome huh? I kinda felt like I went there for the few minutes while reading this…This place is an absolute dream!!! It’s official I’m booking Gili Lankanfushi for my honeymoon!! I can’t imagine a better place on earth!! Thank you for the info and incredible pictures Misha! Yes!!!! Do book it for your honeymoon, you will not regret it! Let me know if you have any questions. UM this is my dream vacation!! We were actually just researching resorts in the Maldives. I’m so glad I came across your post. I should also mention that this hotel is number one on Trip Advisor! Wow this is breathtaking!!! I love that it’s eco friendly. The huts look incredible and the activities sound so fun! I can’t wait to plan a trip here :). Perfect for a romantic getaway. There was air conditioning and I was very thankful for it. They just designed their structures so that they’d need less of it. For example, most of the rooms in our villa were open to the outdoors and got a natural breeze, but the bedroom was air conditioned.